Therapy occurs between two human beings and the therapist brings their whole self to the session and will attune themselves to the person or child in an emphatic way. In play & experiential therapy the therapist may bring their background in art through the creative arts, their love of theatre through role playing, working with puppets or creative movement, their experience with yoga through calming and anxiety reducing techniques, and their studies of cognitive-behavioral techniques to reduce anxiety and fears. It is tenacious work and it is an art. And many refer to it as a calling. In Play & Experiential therapy, we engage the interests and talents of the child and youth so as to connect to their inner world and their sense of who they are. It can be invigorating and challenging work but we are also in awe of how much they know and the insights they have about their life’s journey. This is an exciting time in the field of psychotherapy with the onset of the work of pediatric psychiatrists such as Daniel J. Siegel, of mindfulness scientists and psychologists like Jon-Kabat Zinn, Ph.D. and Tara Brach, Ph.D., trauma specialists such as Peter A. Levine, MD, and Bessel Van Der Kolk, Ph. D. (to name a few) as well as neurofeedback and biofeedback practitioners such as Dr. Tatum that will help advance mental health tremendously for children and adults. More than ever, the Jungian idea that there is an innate drive toward wholeness and health in the human psyche as in the physical body (Dora Kalff, founder of Sandplay Therapy and Jungian analyst) is a view of the holistic approach. In one play therapy workshop, it was said that good therapy had to take place below the jaw; that is, in our bodies, and in our hearts, and not in our head; not just by talking and analyzing things. This is especially true with children of all ages and youth. In many ways, it is our unconscious processes that direct many of our feelings and patterned lives and drive or sabotage many of our good intentions. For this reason, an experiential approach to therapy is an indirect way of bridging our unconscious processes with our conscious awareness and the most effective way is through symbols, play, creativity, art and the instincts or intuition of the body. Yes, we talk and make meaning of our lives and experiences; but that comes later, after we have experienced what has been stored in our bodies and in our creative imagination. Experiential and Play Therapy uses specially selected toys that provide the natural setting for the child to choose what they will play with and how they will play. The toys may follow various themes such as emotional expression, nurturing/family, acting out/aggressive, or conflicts and self-mastery, as well as many others. But, like the book by renowned author, Gerry Landreth, “Play Therapy – The Art of the Relationship”, the therapy hinges on its principles of unconditional acceptance and reflective listening, and the therapeutic relationship. Since this book, there have been many others, which describe the essence and science of play therapy as well as many others that have added depth psychology and more directive and cognitive techniques. In using Experiential Therapy regarding issues related to anxiety, a more holistic approach may engage the three C’s: Calming the Body, Correcting problem Thinking, and Confronting Fears. Learning about the body’s natural Fight/Flight Response, learning breathing techniques, and learning how to practice mindfulness can all be very helpful. Correcting problem Thinking involves looking at faulty thinking by using cognitive behavioral techniques. Confronting Fears involves using small incremental steps at scheduled times to face fears. And adjunctly, Sandplay Therapy may be used. We have seen much success using this therapeutic method with children and youth. 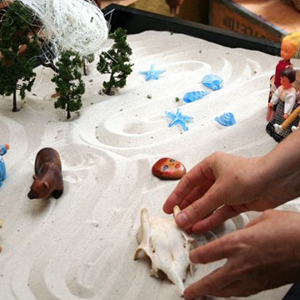 Sandplay therapy is hands on psychological work as it provides a nonverbal and non-rational way of expressing feelings and experiences often inaccessible and/or difficult to express in words. Children and teenagers usually like it and are easily absorbed by the process of building a world in the sand. In Sandplay a scene is made from miniatures and objects made in a box of sand; a concrete manifestation of their imaginal world. The construction of the scene is made entirely by the choices made by the hands of the child or adolescent, while the analyst watches nearby in respectful silence. It has the possibility of leading them into layers of experience that are often pre-verbal and long forgotten to the conscious mind. By this symbolic activity and through the experience of free and creative play, unconscious processes are made visible in this three-dimensional form. The process of Sandplay tends to activate healing at the deepest level of the psyche. The scenes are made and viewed together by the client and analyst as if viewing a work of art that is highly personal and sensitive. After the session, it is photographed, so the analyst can view instinctual themes and the symbolic language of the inner world as it unfolds in patterns in the trays over time. The therapeutic benefits from Experiential/Play and Sandplay allow children and youth a sense of being more grounded in themselves, have more self-control and demonstrate better control of their emotions, and heal at an unconscious level. Children and adolescents will tend to become more confident, more adaptable or resilient to different situations, and able to express themselves more efficiently. Now isn’t that what we all want for our kids? If you want to learn more about the benefits of experiential play, please call us at 407-644-3593.